President Muhammadu Buhari held a brief meeting with Acting President Yemi Osinbajo, service chiefs and heads of other security agencies, after he arrived from London yesterday. The closed-door meeting was held at the president’s official residence inside the Aso Rock Presidential Villa. 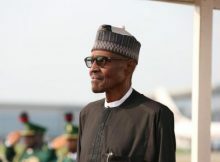 A number of youths, who attempted to make their way into the Presidential Villa to welcome the president, were also barred by security operatives. Buhari returned to Abuja today, after over 100 days in the UK on medical vacation. Previous Post:Federal Government Reacts To Video Of Olamide’s Hit Single Wo!